Money traders in economically depressed Zimbabwe say the country's currency has tumbled to a record low of 25 million for a single U.S. dollar. It's easy being a multimillionaire in Zimbabwe these days, at least if you're counting in local dollars. Money traders in the economically depressed African country say the Zimbabwean currency has tumbled to a record low of 25 million for a single U.S. dollar. The black market exchange rate for the U.S. dollar first broke through the $1-million Zimbabwe mark in late October. Since then the plummet has been even more dramatic amid political uncertainty and an annual inflation rate topping 100,000 per cent. That has led holders of hard currency — such as U.S. dollars — to hang on to their money at a time when the central bank is pumping more local cash into the market to pay its bills. 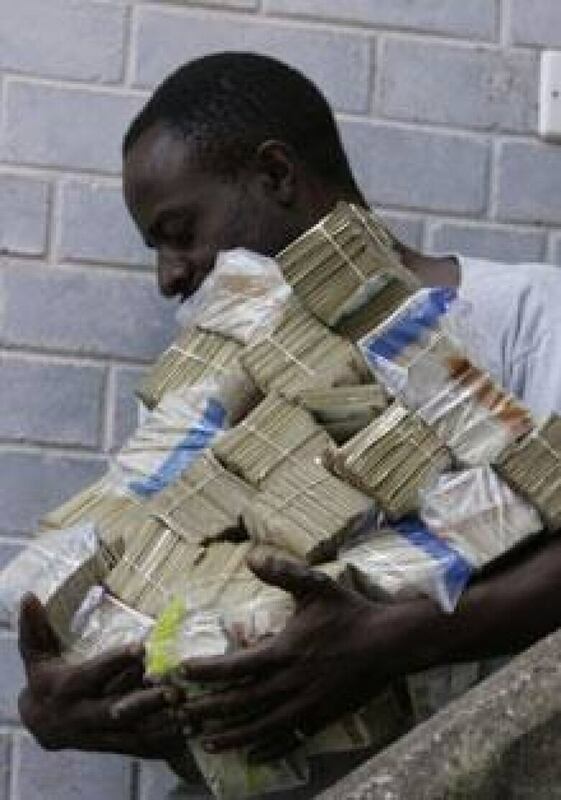 Zimbabwean dollars are now available mostly in bundles of $100,000 and $200,000 notes. Just what does that mean? Consider this: cash in one $100 US bill and you get to cart away almost 20 kilograms of the local currency. One black market dealer, who asked not to be identified for fear of reprisals, says the Zimbabwe currency is also being pushed down as the government buys hard currency on the black market to pay for power, gasoline and other imports ahead of the country's scheduled March 29 election. Until last year, the former regional breadbasket was self-sufficient in canned and processed foods, household goods, soap, toothpaste, toiletries and other items. Now such goods must be imported from neighbours Malawi, South Africa and Zambia and from as far afield as Egypt, Germany, Iran and Malaysia. According to latest official poverty data, an average family of five in Zimbabwe needs a monthly income of $35 US to survive. But most general hands and other lower paid workers earn less than the equivalent of $10 US a month amid an unemployment rate of 80 per cent.